We consider our beachcombing outing at Sunrise on Sea on 7 December 2012 to be our first real beachcoming outing, even though we have sometimes brought home a few seashells or small pieces of driftwood over the years. This particular beachcombing outing had purpose. 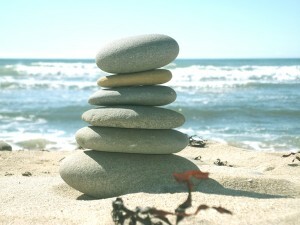 Tony built a small tower of pebbles at Sunrise on Sea beach on 7 Dec 2012. We do freelance work from home, mostly designing and hosting websites, setting up WordPress sites, helping people with the SEO of their sites, and offering various other forms of general website help, but work was a little quiet in early December 2012. 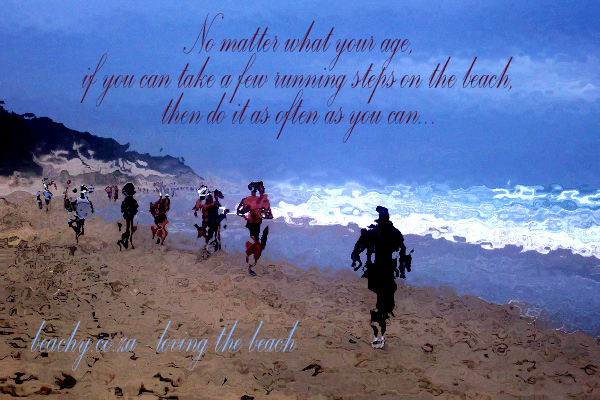 We have decided to see how we can earn a little extra income, and if visiting the beach can come into it, great! So after dropping the boys at school for a short morning at school (due to 7 December 2012 being the last day of school in the Eastern Cape before the Christmas school holidays) we drove down to Sunrise on Sea. It was round about this time that we first joined Pinterest, but we had not yet discovered the amazing popularity of sea glass in the United States and elsewhere, so we just looked for a few seashells and pieces of driftwood. We didn’t even know if we’d really seen any pieces of sea glass at Sunrise on Sea since we weren’t looking for sea glass, so went back to Sunrise on Sea beach on Christmas day, after lunch. We couldn’t find any sea glass at Sunrise on Sea on Christmas day, but did find some lovely pebbles and a bit more driftwood, and a lot of damp rope all tangled up and half covered by sand – about 40 metres of roughly 2cm thick rope once all untangled. This pretty pebble was my favourite find at Sunrise on Sea beach on Christmas day. I think I see either an old lady or a little girl in a nightgown kneeling to say prayers at her bedside. Do you see her too? 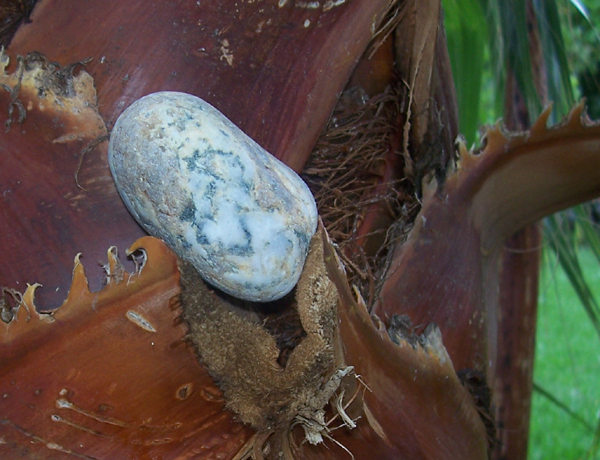 To photograph this pretty pebble I put it in a palm tree at home, which is about 3 metres from our little home office door. 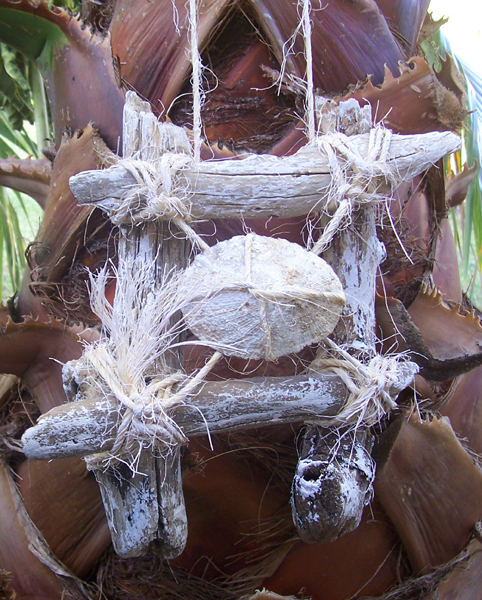 The palm tree acts as an excellent prop for many of our beach findings items when we want to photograph them. You can see a picture of me beachcombing at Sunrise on Sea on 7 December 2012, and a picture of Tony beachcombing at Sunrise on Sea on Christmas day 2012, on the about us page of this site. Pinterest, and thus also websites that Pinterest pictures link to, have given us a ton of ideas, and we plan to make (and sell!) many useful, pretty, just plain cute, or lovely beach house decor items with the things we find on the beaches in and around East London. It was a hot day when we visited Sunrise on Sea Beach on 7 December 2012, but on Christmas day it was cooler, and in fact we left the beach just as it started to drizzle. We did have time to take a few photos, however, and even took a video or two to capture the peaceful and wonderful sound of the ocean retreating through the pebbles of a particularly rocky area of the beach.